Pa. Republicans are talking about impeaching state Supreme Court justices. Do they have an argument? 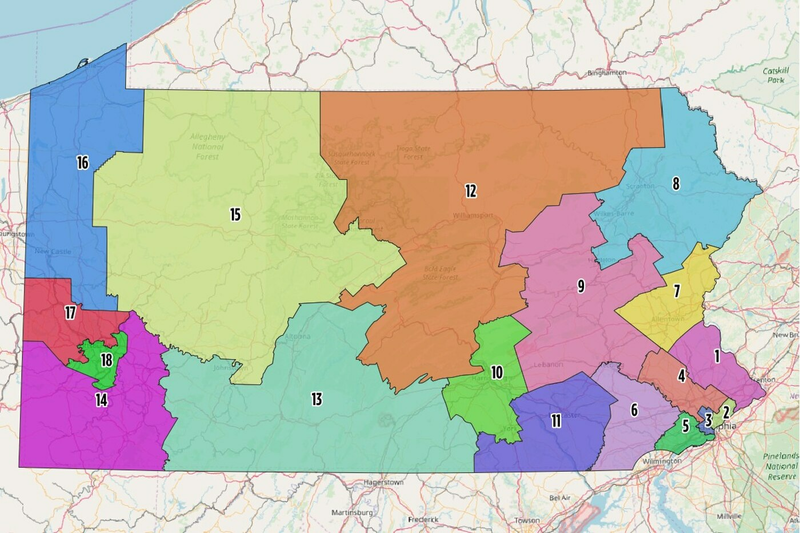 The new congressional map released Monday by the Pennsylvania Supreme Court. Pennsylvania Republicans, furious that the state Supreme Court threw out the existing congressional map and imposed one that stripped much of their partisan advantage, have been talking about a stark response: impeaching the justices who ruled against them. After a rank-and-file lawmaker, state Rep. Cris Dush of Jefferson County, raised the idea a few weeks ago, the rhetoric has intensified. This week, U.S. Rep. Ryan Costello of Chester County said the justices "should be impeached" and U.S. Sen. Pat Toomey said the idea is worth discussing. A call to impeach judges isn't unprecedented, and amid an ever-polarized country has at times become a clarion call sounded by Republicans against what they claim are overreaching "activist" judges. But only once has a Pennsylvania Supreme Court justice been impeached and removed from office — Justice Rolf Larsen after being convicted in 1994 of criminal conspiracy. Dush's proposal calls for impeaching five at the same time, an act that would almost certainly throw the state judicial system into a tailspin. Constitutional law scholars disagree on whether there may be grounds for impeachment — the first step in removing the elected justices from office. Dush and his supporters say the Democratic justices who voted 5-2 to invalidate the 2011 congressional map passed by the GOP-led legislature violated the U.S. Constitution by trampling over the redistricting rights that by law belong to the General Assembly. But all experts said the legislature should refrain from the attack on the judiciary. Judges are usually impeached for criminal or corrupt behavior, they said, and none could recall a time when a Pennsylvania judge at any level had been impeached for a controversial ruling. Republicans are "flirting with an idea at odds with American history and dangerous to the rule of law," said Seth Kreimer, a professor of state constitutional law at the University of Pennsylvania. "A system in which a judge may be impeached and convicted because the legislators disagree with her vote in a particular case may appeal to unabashed and unrestrained populists. But it is not the system under which America has lived and thrived." As of Thursday, no impeachment bill had been introduced. But in the memo he circulated to fellow lawmakers, Dush contended the high court's ruling redrawing the congressional map "blatantly and clearly contradicts the plain language of the Pennsylvania Constitution." At issue: The state constitution lays out the amount of time the governor has to consider a bill before vetoing it, and the state legislature then has the power to override the veto. When the state court overturned the congressional map as an unconstitutional partisan gerrymander, it gave the legislature less than three weeks to draw a new map and Gov. Wolf, a Democrat, six days to approve or veto it — not the 10 provided under the constitution — before the court drew its own. "They have absolutely no authority to say that if the governor vetoes, that it does not come back to the legislature. That is specific under the constitution. I am protecting the rule of law," Dush said when confronted by protesters earlier this month. "This is not about gerrymandering." Republicans have also broadly argued that the court usurped the authority of the legislative and executive branches. The state constitution does not say very much about impeachment, which is essentially the legislative process of formally accusing an official with wrongdoing. The constitution says, in part: "The governor and all other civil officers shall be liable to impeachment for any misbehavior in office." But the constitution does not define the term misbehavior, leaving state lawmakers to decide what conduct should trigger removal from office. "Nobody knows what it means," says Bruce Ledewitz, an expert on state constitutional law at Duquesne University. Ledewitz, who said he's "as partisan a Democrat as you can get" and agrees that the old map was gerrymandered, believes legislators should not move ahead with impeachment because it could create chaos in state government, even though he sees valid legal grounds. The justices, he said in an interview, "trampled every judicial process norm you can imagine." If state lawmakers "believe judicial norms were trampled, they get to say if that's an impeachable offense," he said. "No one can second-guess them." Republicans control both houses of the legislature. Impeachment would require a majority vote in the House; a conviction would require a two-thirds majority in the Senate. The Democratic justices, each elected to a 10-year-term, are Max Baer, Kevin Dougherty, Debra McCloskey Todd, Christine Donohue, and David Wecht. None is up for retention until 2023. Republicans have argued that the five-judge majority seemed intent from the start on throwing out the congressional map and drawing its own. A lower court had stayed the gerrymandering case, but the Pennsylvania Supreme Court took over the case in November, fast-tracking it as involving "issues of immediate public importance." In part, the court said the map should be redrawn in time for voters in the May primary election. Ledewitz has argued that the justices improperly ignored the lower court's stay; didn't provide the legislature enough time to draw a new map "in the normal course of legislation, under the guidance of a real opinion;" waited too long to actually issue its opinion; and rushed for a redrawn map for the 2018 elections, instead of 2020. Other experts disagreed the court has done anything inappropriate. "The gerrymandering cases — they're difficult cases, they involve a lot of difficult legal issues and courts have been struggling with them for some time," said Robert Reinstein, a constitutional law professor and former dean at Temple University's law school. Impeaching a justice over a legal ruling would be unprecedented, the experts said. Larsen had been convicted of criminal charges — conspiring to obtain prescription drugs — and had already been removed from office when lawmakers convicted him of corrupt self-dealing. Similarly, judges in lower state courts and federal court have been impeached for criminal activity or corruption, Reinstein said. The only other reason he has seen cited has been incompetence, such as being mentally unfit. "Unless there's some evidence of criminal activity or some corrupt intent on the part of the justices, I don't see any basis for impeachment," Reinstein said. Kreimer, the Penn professor, agreed that history supports the idea that judges can be impeached for corruption — and that the Supreme Court justices do not appear to have overstepped in this case. "I know of no similar precedent suggesting that it includes the 'crime' of voting to dispatch Goofy kicking Donald Duck in disregard of the wishes of a majority of the legislature," he said, using a popular description for the contorted Seventh Congressional District under the previous map. If the state legislature disagrees with the state court's interpretation of the law, there's a process that doesn't involve attacking the individual justices, said Justin Levitt, a law professor and associate dean at Loyola Law School in Los Angeles. "If the Supreme Court interprets a statute wrong, the legislature can pass a new statue saying, 'No, what we meant was X,'" he said. If the issue is the state constitution, he said, the legislature could propose a new constitutional amendment, "and the people can vote on it."